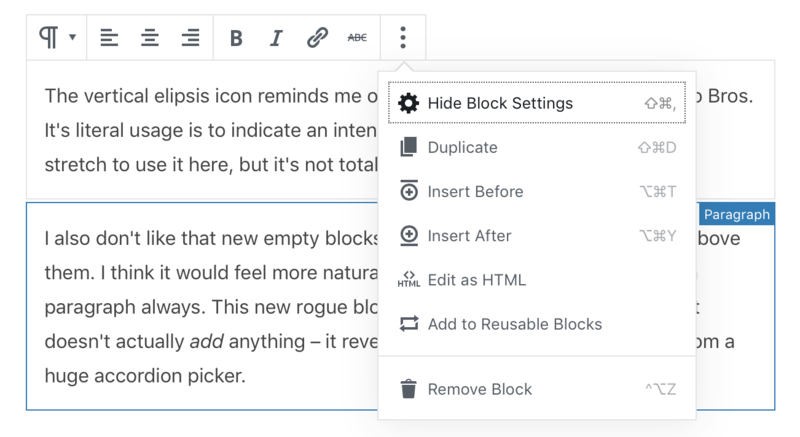 I’m writing this post using the new block-based editor that comes packaged with the first WordPress 5.0 beta, known previously and externally as Gutenberg. For just general writing, so far it ain’t so bad, but one thing that bugs me straight away is that the auto-save causes the UI in the upper right corner to jiggle around every few seconds. I keep thinking it’s a notification in macOS, so I stop writing to look up at it, because it’s all just outside my periphery. I type. I pause to think. Autosave triggers. I look up and right. I forget my original thought. 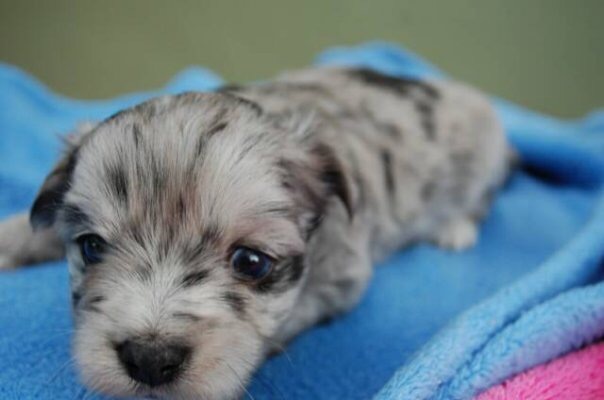 In this post, I haven’t needed to add any blocks or format any text, and I haven’t needed to move any text or paragraphs around. I have a feeling this is how most people will interact with this editor most of the time, and for that, it generally gets the job done no different than the classic editor did. 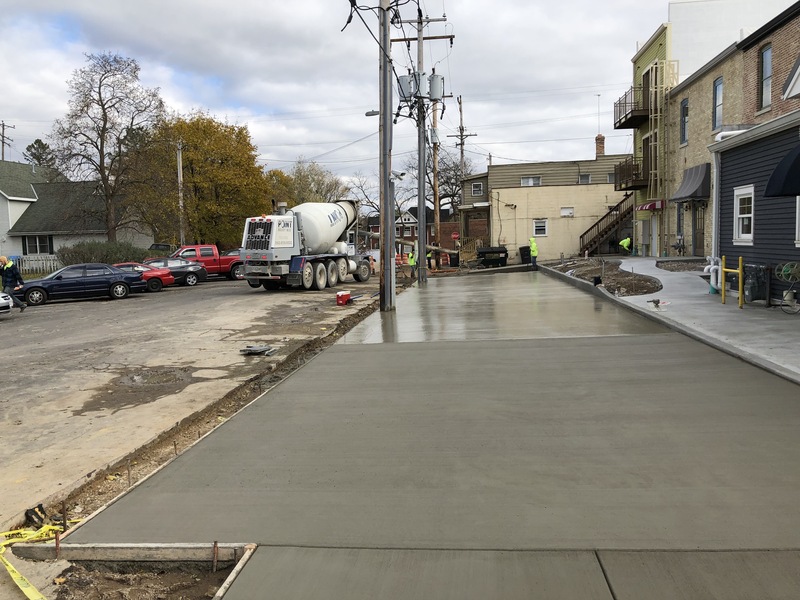 I suppose it’s about time I try to insert some kind of image, so here’s a shot I took today of some concrete that got poured behind the building my office is in. It’s weird when I hover over the “P” for paragraph button, that it changes to 2 arrows creating a circle. No other buttons change their contents on hover; what makes that one special? And it changing makes me afraid to interact with it, because I’m afraid of what it does now. The vertical elipsis icon reminds me of Pokey the cactus from Super Mario Bros. It’s literal usage is to indicate an intentional omission of a word, so… it’s a stretch to use it here, but it’s not totally semantically inaccurate, I guess? I also don’t like that new empty blocks don’t have the hover-bar UI thing above them. I think it would feel more natural if the new default block were just a paragraph always. This new rogue block has a “+” next to it, but clicking it doesn’t actually add anything – it reveals a menu to pick the block type from a huge accordion picker. The more that I move the mouse to pick blocks and click on things, I’m noticing a lot of hidden UI reveal itself and then disappear in ways that don’t feel natural to me. I’m not digging this part of the experience at all. There are grey and blue hover/focus outlines on blocks, toolbars pop-up, the buttons in them have tooltips that pop-up, and there’s a grabber UI for relocating blocks that comes and goes – it’s just… a lot going on. I’m going to try the drop cap feature on this block. It’s turned on (blue) now, but I don’t actually see a drop cap. If I save and preview the post, it’s there, but it’s not in the editor. Oddly, it’s targeting both the “I” and the apostrophe from “I’m” which doesn’t seem correct. Why wouldn’t it just target the first letter by itself? Oh. So the drop cap is only visible when I’m not typing in the box. When I hit enter and created a new block, the drop cap became visible in the editor. That feels super weird, but it’s hard to know if that’s a bug or a feature. That’s kinda how I feel with most of this so far – it all feels like everything is very intentional, while also feeling like nothing I want it to do. 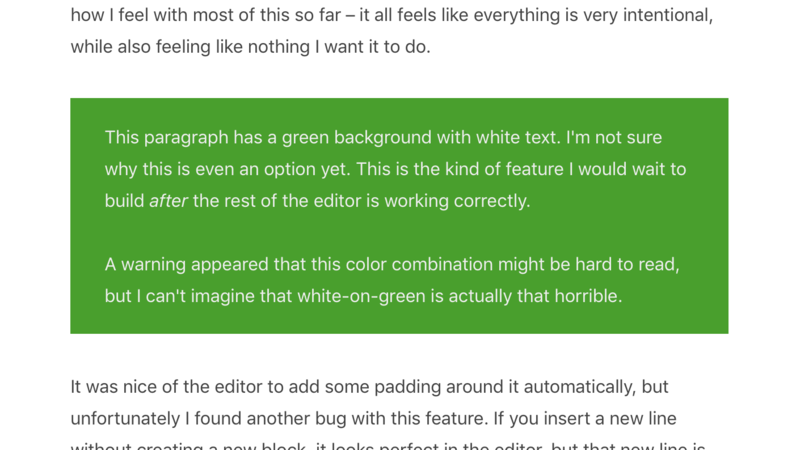 This paragraph has a green background with white text. I’m not sure why this is even an option yet. This is the kind of feature I would wait to build after the rest of the editor is working correctly. A warning appeared that this color combination might be hard to read, but I can’t imagine that white-on-green is actually that horrible. It was nice of the editor to add some padding around it automatically, but unfortunately I found another bug with this feature. 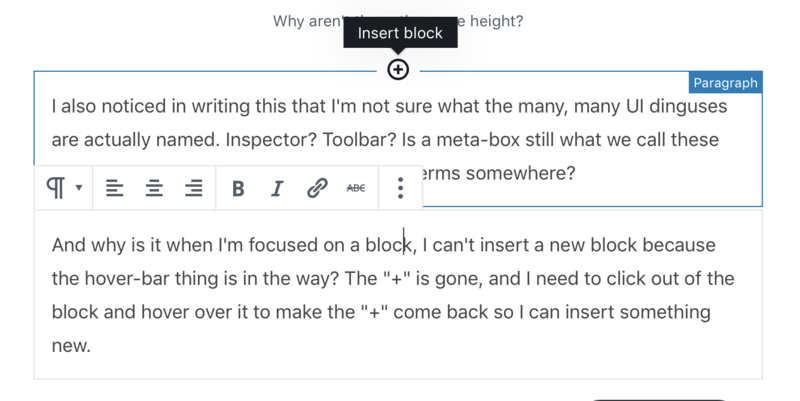 If you insert a new line without creating a new block, it looks perfect in the editor, but that new line is interpreted as a new paragraph when previewing it theme-side. These side-by-side images went in pretty normally, but I think the gradient effect is not the greatest. It’s odd that the “Settings” sidebar thing, under “Block”, doesn’t actually let you change the block type there. It shows what kind of block it is, but clicking it does nothing. Why isn’t that a block-picker? It has the same icon in it as the hover-bar thing, but it’s not interactive. Why aren’t these the same height? I also noticed in writing this that I’m not sure what the many, many UI dinguses are actually named. Inspector? Toolbar? Is a meta-box still what we call these inspector sections? Is there a glossary of terms somewhere? And why is it when I’m focused on a block, I can’t insert a new block because the hover-bar thing is in the way? The “+” is gone, and I need to click out of the block and hover over it to make the “+” come back so I can insert something new. I just floated that button over there, which worked OK, but now I lost it because I inserted a block ahead of it. No idea how that happened. Let me try that again. OK I think it’s back. Color picker is nice. Why no hover color or effect? The button block had a button with an “enter” looking arrow in it that, when hovered over, popped up a tooltip that said “Apply.” I clicked it, and it didn’t do anything. I assume it applied, but what did it apply? Why is it an “enter” arrow looking thing? I’m feeling a bit overwhelmed with iconography at this point. The hover-bar is back. What’s it got there? Hovering over the list icon brings back the double arrows again. No like. This is a quote block. This theme of mine supports them. Hopefully it works! Looks like I need to use the arrow-down key to get out. This is a heading. The “Settings” inspector thing has options here. I can pick H1-6, plus text alignment. I’m gonna center it, because why the heck not. I'm gonna write some 1337 code in this box. Hitting enter in here also does not break me out of the block. I guess it's arrow-down time again. Yep. That did it. But now that I’m in this paragraph block, arrow-down doesn’t do anything. So weird. Hitting enter got me here. ^— That’s a spacer. Why is that even a block option when basic things like lists don’t work correctly? Hitting tab kinda focused on this one, but I still couldn’t type in it. Finding the parent block to adjust the number of columns is really hard. I needed to hit the down arrow to get out of the column block. Here’s me testing the “Media & Text” block. This one seems to work like I expect it to, except there is no parent-block hover-bar picker thing, and clicking the image doesn’t do anything. I expect that to pull the media library back up. How do I change that image? Oh. I need to click the parent block for a hover-bar to appear. So, now it’s a click-bar? Huh. I couldn’t enter out of the above block, so arrow-down again! Hitting enter brings me to a new line in this same block. Now, hitting enter a third time brought me here. That felt like a bug, but I’m honestly not sure how I’d duplicate it. Had to arrow-down out of that one, too. I guess it’s just paragraphs that need entering out of, and maybe other random ones? Oh wait… Category search doesn’t work. UGH. We’re all pretty brilliant folks (especially you, since you’re reading this) and convincing us we could be more-brilliant about stuff isn’t always easy, especially anything that deals with our businesses, relationships, or visions for either or both. We need evidence. We need proof that if we’re going to change up our strategies or approaches with our money-makers, they will actually work and not be another experiment or “valuable learning experience.” I mean, I like learning new things probably more than most people, but I am not a fan of re’learning something I already thought I knew. The world is round – I don’t want to learn that it’s not – and CaboPress will teach you how to navigate the WordPress business world regardless of its shape. Here’s how I navigated CaboPress this year. No foolin. I bet the story here is a fun one. January & February were very busy and eventful months for me, as I’ve been working full-time on WordPress Core & Community related endeavors thanks to two companies, and largely 2 individuals, who decided to take a bit of a risk and try something relatively new with me. The scene is WordCamp US 2016 in Philadelphia, PA – the weather is surprisingly warm and the event is abuzz with close to 1800 WordPress fans in attendance. For me, it’s a reunion of sorts, because it’s only a few times per year I’m able to have in-person time with many of my ex-coworkers, current open-source colleagues, and friends I’ve made thanks to WordPress but maybe haven’t collaborated with yet. I had several really productive conversations, mostly me pitching the idea of asking for financial support to “work on WordPress” in a way that does not place the burden on any one specific company, and Josh from Pagely and Josh from Pantheon both welcomed the experiment with open minds and were excited to get started. I refer to the WordPress 4.7.2 release as “January” as I spent the majority of it reviewing & hardening several important security improvements to the core codebase (namely, the REST API and Press This.) In addition, I upgraded bbPress across all of WordCamp.org, and laid the groundwork for upgrading bbPress across all of WordPress.org in the coming months. The security team also paired up with liaisons from almost all major hosting companies and CDNs to bring awareness to and monitor for any public exploitation attempts, and I was actively involved in on-boarding and expectation setting while we introduced an entirely new workflow for all of us. With WordPress 4.7.2 “January” out, things “settled down” and I switched to LoopConf mode where I gave a talk about how Unix Philosophies apply to WordPress development, and was interviewed by Brian Krogsgard of Post Status fame about the longevity of open-source software (I’ll embed that video below.) LoopConf was great, Salt Lake City was fun, and I’ll do a separate write-up about my experience soon. I’ve also focused more the backlog of issues and nice-to-haves for the bb’s, largely related to how the WordPress.org Support team works with it as a tool. Working with other volunteer contributors like Boone Gorges, Stephen Edgar, Brandon Allen, and Sergey Biryukov again, has been a treat. I have 2 weeks “off” planned in March for WordCamp Miami and my wedding anniversary, and I’ll be speaking at CypherCon 2.0 in Milwaukee and I think a few other events that I can’t remember right now that I’ll come back and update later. Development wise, I suspect will be more of the same: security, on-boarding, WordCamp.org, and bbPress upgrades across WordPress.org. I’m also going to help Pantheon with some marketing, which is something I’m excited to help with and learn more about, since I’ve spent most of my career helping build the things other people get to pitch to the world. And here’s that Post Status video I mentioned earlier. On December 4, at WordCamp US, an idea was formed. Over beers and snacks, a small group of friends lamented the lack of appreciation for Tweetstorming. “Get a WordPress” people say, as if the thought never crossed their minds that 37 tweets in a row about the same thing starts to defeat the purpose of Twitter. Myself, being the most stubborn, independent, and likely drunk of our group, volunteered to solve this problem the only way I knew how – a WordPress plugin. Having helped build Jetpack’s Publicize feature all those years ago, it wouldn’t be my first rodeo, but now that it’s working, it just might be my last. Introducing Publishiza, the shittiest way to Tweet your thoughts while also blogging about them too. Check out https://publishiza.com to learn more. WordPress, to me, is an independent publishing platform. It grants me the right to complete & total autonomy when it’s desireable, but also allows me to group up with others when that makes sense too. An article from The New York Times puts into a nice perspective why I think WordPress is really important to the future of the web. Every pirated music video or song posted on YouTube or Facebook robs the creators of income, and YouTube in particular is dominated by unlicensed content. Google’s YouTube has an over 55 percent market share in the streaming audio business and yet provides less than 11 percent of the streaming audio revenues to the content owners and creators. But Facebook, which refuses to enter into any licensing agreement on music or video, is challenging YouTube in the free online video and music world. I don’t think this is anything new – tides will shift, and new technologies will emerge to try and help with distribution of content – but it’s scary to me now that so much of what’s being published funnels out into our enormous world through only a few hoses. There’s more money in the world changing hands than every in recorded history, and I suppose it’s always been this way – content creators are starving artists and content distributors are benefactors – but the trickle-down distribution of wealth continues to run perpetually dryer vs. wetter. 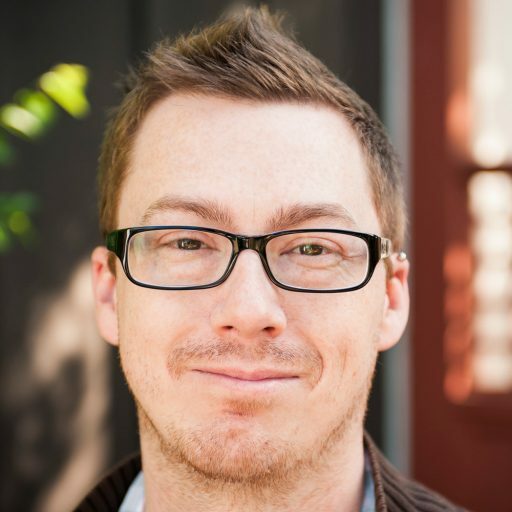 I think in the WordPress space, companies like Envato are undervalued. Their operating costs are surely not as low as one may think, yet they continue to pay out millions of dollars to digital artists & creators. I think there may be room for more Envato’s to carve out their own niches, and WordPress plugins like Easy Digital Downloads and WooCommerce are the long-term solutions for people hoping to have a sustainable independent lifestyle. In 2014, Matt Mullenweg challenged the WordPress community to volunteer 5% of their time towards open-source and WordPress.org. A few months later, I ran a successful fundraising compaign that allowed me to donate 6 months worth of time towards BuddyPress & bbPress. For 2017, and hopefully with your help, I’m going to try something a little different that I’ve nicknamed: 💯∞. My goal is be a fully funded independent ambassador for WordPress & the surrounding initiatives, backed by many of the best companies who continue to push WordPress beyond its limits on a daily basis. Practically speaking, I imagine this to work like a monthly retainer to work on WordPress core and Dotorg. Someone pays, say, $7500, and I get to say January 2017’s progress was brought to you by Pagely, February by GoDaddy, March by CrowdFavorite, April by Jetpack, May by WebDevStudios, June by GiveWP, and so on, forever. It’s like a podcast, but instead of airtime ad placement, it’s coretime leadership, contributor relations, and issue management. Some of y’all who think this is somewhat unconventional may say – Why not just be a full-time employee? That may end up happening – it may actually be the smarter move in the long run here – but I think there’s high value in being an independent, nonpartisan thought leader that *wants* to help everyone navigate the ins & outs of contributing to open-source, more specifically WordPress, et al. Since that’s where I’ve seen the most success, I’d like to put maximum effort into continuing that trend; if it’s not sustainable, then we learned something together and try something different. This weekend at WordCamp US, I’ve had the pleasure of meeting with several folks who love the idea and are… deeply… interested in making this work however they can, up to and including growth beyond myself for other individuals who are able to provide more value as an independent voice. If you’d like to help, please email me. If you have questions, concerns, criticisms, or feedback, please get in touch somehow. Thanks for having an open mind, and for considering investing in the future of something that really, truly means a lot. To the folks who are already onboard, I’m so excited you are willing to give this a try with me. P.S. Have I mentioned how much better WordPress is on mobile? I wrote all of this from my iPhone without any issues, which is still so incredible to me. Great job, mobile team! P.P.S. If you’re unfamiliar with why I think I can do this, I’ve contributed to every major WordPress release since 2.5, am a member of the security team, meta team, and have helped lead BuddyPress & bbPress since 2009. I love WordPress and want to help it continue to grow in whatever direction it needs to take. I’m going to do it anyways, and with your help we can do it together.